So, just what does she know? 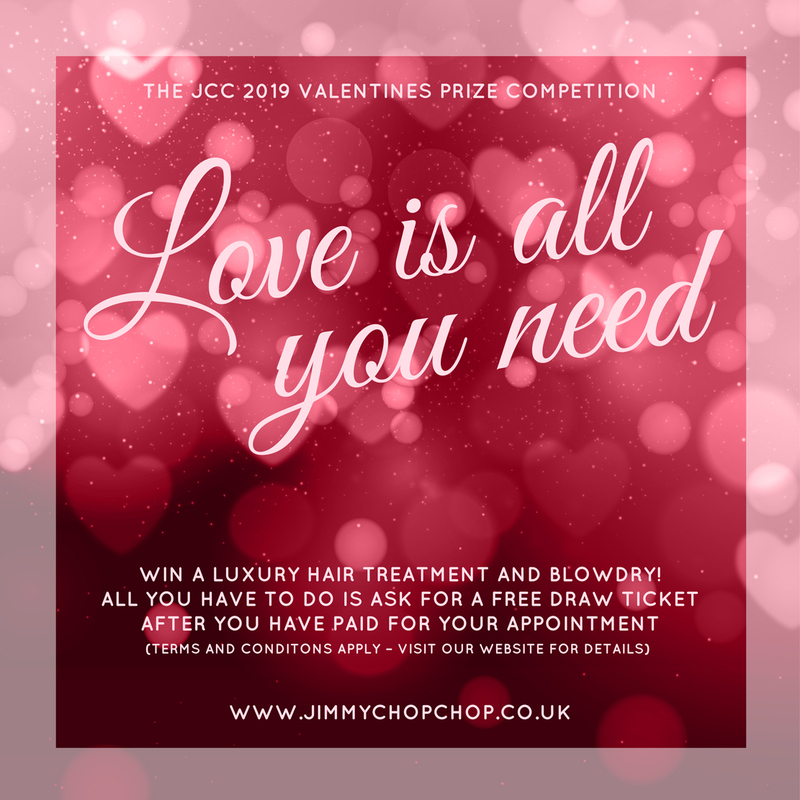 She knows that Jimmy Chop Chop’s hair salon in Crawley offers chic, modern and stylish cuts and highly skilled hairdressing to uplift and refresh her style. Nothing is too much trouble for their thoughtful, talented and attentive team. She also knows that her hair is her perfect accessory. A reflection of the life she leads and the person she is. So give your hair an unfair advantage too. Of course, our regular promotions for Recommend a Friend and our Loyalty Card are always available. Plus our fantastic range of Gift Vouchers for you to splash out on a friend, relative or yourself, can be purchased from the Front Desk! Win a fabulous free treatment! This is a free prize draw, entry is free and the winner is chosen at random. Full terms and condition below. THE FULL NAME AND ADDRESS OF THE PROMOTER: JIMMY CHOP CHOP, 64 THE BOULEVARD, CRAWLEY, WEST SUSSEX RH10 1XH. TELEPHONE: 01293.530690. RESTRICTIONS ON WHO CAN ENTER: ANYONE WHO HAS A PAID FOR APPOINTMENT BETWEEN NOW AND VALENTINES DAY. OVER 18S ONLY. HOW THE WINNER WILL BE DECIDED: YOU WILL BE GIVEN A RAFFLE TICKET WHEN YOU HAVE PAID YOUR APPOINTMENT AND THE NUMBER WILL BE ENTERED INTO A RANDOM DRAW BY A NON-MEMBER OF MANAGEMENT OR STAFF OF JIMMY CHOP CHOP. THE WINNER WILL BE NOT BE REQUIRED TO PARTICIPATE IN ANY POST-EVENT PUBLICITY. WE RESERVE THE RIGHT TO OFFER AN ALTERNATIVE PRIZE OR AMEND THE RULES OF COMPETITION IF NECESSARY. Call the salon 01293 530690 to book this great offer!! 50% off colour with every full priced Cut and Style booked on a Tuesday! Unfortunately Terrific Tuesday deals are not to be used in conjunction with any other discounts. THIS OFFER IS AVAILABLE FOR SELECTED STYLISTS ONLY. 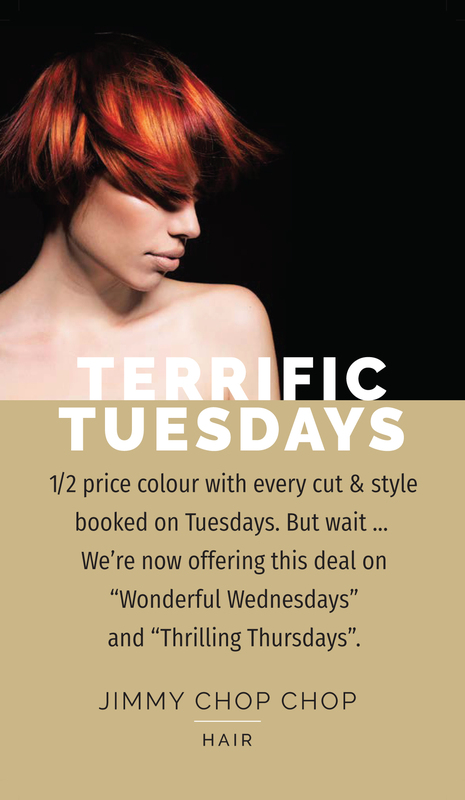 OFFER ONLY APPLIES TO A CUT AND STYLE APPOINTMENT THAT FALLS ON A TUESDAY AND THE 50% COLOUR DISCOUNT ONLY APPLIES IF THE COLOUR TREATMENT IS TAKEN AT THE SAME TIME AS THE CUT AND STYLE. JIMMY CHOP CHOP RESERVES THE RIGHT TO CHANGE THESE TERMS AND CONDITIONS AT ANY TIME. 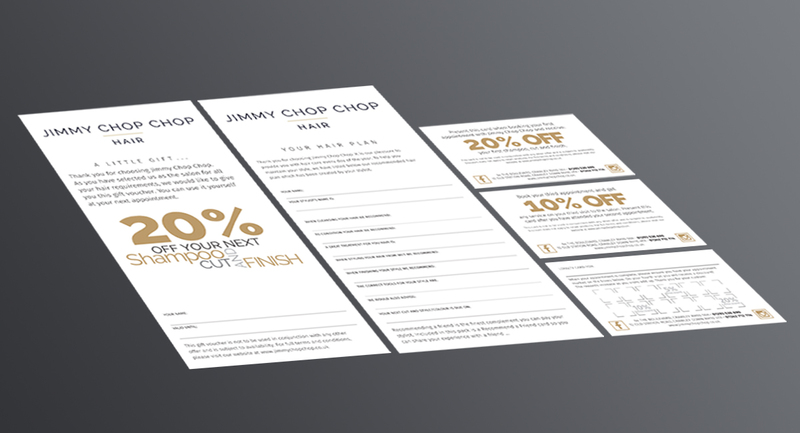 From February 2017, Jimmy Chop Chop are delighted to offer all new customers our “New Client Pack”. The pack contains a handy hair plan that your stylist will create for you. You will also get a 20% off voucher and for clients booking a third appointment there is a further 10% off that appointment. We’re not only treating you ... there is also a 20% discount card for referring a friend. The pack also contains a loyalty card which enables you to earn even more saving in the future.